10/10 would roll my eyes. 1. When people rush in without letting you get off the elevator first. And then they have the audacity to get mad when you try to get out. COME ON. 2. When everybody refuses to move back (where there's so much space). The elevator isn't going anywhere, and it's not a scene from Saw. Makakalabas ka, dontcha worry. 3. When they see/hear/sense you running, and they still press "close." "I don't know who you are. I don't know what you want. I can tell you I don't have money...but what I do have are a very particular set of skills. Skills I have acquired over a very long career. Skills that make me a nightmare for people like you." 4. 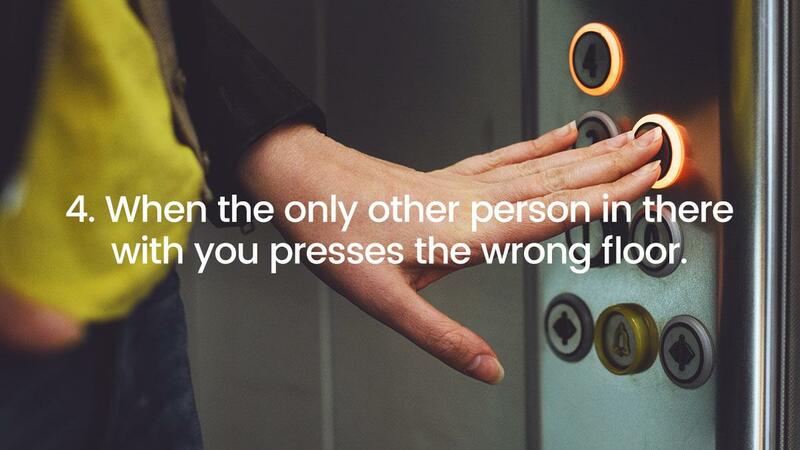 When the only other person in there with you presses the wrong floor. 5. When someone is singing out loud while wearing earphones. 1. Kalma. This ain't a musical. And 2) Nag-earphones ka pa?! 6. When someone squeezes herself in an already-crowded elevator. *cue music* "Still alive, but I'm barely breathing." 7. When you just know the creep behind you is reading your text messages. And you're tempted to type: "MIND YOUR OWN BUSINESS." 8. When it smells like someone bathed in cologne. And not only can you feel your lungs collapsing, you also walk out of there smelling exactly like her. 9. When an obviously sick person presses a button. Or touches anything. Or breathes. Unlike Selena Gomez, you should keep your hands to yourself. 10. When people are talking about an episode of your favorite show that just aired. "Napanuod mo ba kagabi? Namatay si..." It's been less than 24 hours...ZIP. YOUR. LIPS.